How to login to ThinkOrSwim, TD Ameritrade’s professional trading app. ThinkOrSwim is a professional multi-market trading platform from TD Ameritrade. After running the installer, launch the platform. A window will appear that says “Checking for updates…” After it makes sure there are no updates to install, the log in screen will appear with a field for username and password. There is a settings icon in the lower left that you can click to adjust the look and feel of the platform, from light themes to dark themes. You can also adjust the system’s font size to make it easier to read. The settings screen also shows you login options such as how much memory to devote to the platform, and whether or not to connect through a proxy server. After you save your settings, you’ll be back out on the log in screen. There is also a “?” icon that, if clicked, shows the 800 number to call for technical support for the platform. If you forget your used ID, you can call this number, or visit https://easycators.com/loginhelp to contact TD Ameritrade. If you forget your password, you can visit that same page to reset it and have a new password emailed to you. Once you know your username and password, you can click the lock icon in the user ID field to save it so you don’t have to type it in every single time you launch the TOS platform. After you do that, type in your password and hit enter, and the platform will launch. Click the gear icon / Setup menu at the top right of the platform screen. Select Application Settings from the menu that appears. Then select Startup on the left side of the popup window. Uncheck the selection that tells it to show the home screen on every start up, and click OK.
That’s it! You’ve logged in to the thinkorswim platform! This article tells you exactly how to find your way around the ThinkOrSwim login screen. 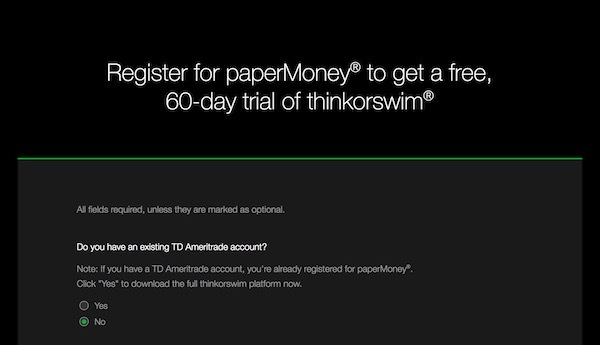 If you’re new to TD Ameritrade’s think or swim platform, read on for more information on getting started and logging in to trade. The first thing you need to know is how to get ahold of the program itself. Just go to our thinkorswim download page if you don’t have the application installed yet, and download thinkorswim. Launch the installed and go through the prompts, making sure you install for all users. Once you’re done, click OK and the program should launch on its own. Once you type in your username, you can click the “lock” icon in the field. This saves your user ID so that next time you launch the program you won’t have to type it in again. It basically saves you some time and effort each day. The question mark icon is there just in case you run into any technical difficulties on startup. Basically it just gives you the toll free 800 number to call in case of technical issues to get customer support. Here you have some options you can set before launching the platform. First, you have the color theme. Most people use the dark them, and that’s the one I prefer as well. It’s a little easier on the eyes after staring at your screen for several hours, in my opinion. But you can select a light them or whatever other options you prefer. Next you have the font size. If you have a small monitor then you might want to choose the smaller font size to be able to squeeze more onto your screen. If you can’t read small text very well, on the other hand, you may need to set the font to be larger. After that you have a space for a proxy server address in case you need to connect through a specific server. Most people can simply ignore this. In the next two fields you can specify a minimum and maximum memory allotment for the platform. This basically tells TOS to go ahead and block out a certain amount of RAM on your computer to be used just for this program. It comes with some default settings, but if things are running slow, you might want to bump up the minimum and maximum settings. The platform will actually alert you later if you start running low on memory anyway. If you ever mess something up or make a change in the software that you don’t like, don’t worry. The platform automatically backs itself up, and you can always rollback to a prior version. Or if you have a version saved externally from a different computer, you can always load that one as well. Just click the clock icon and select the date of the backup you want. If you want to choose a backup saved somewhere other than the application’s main folder, select the last option in the menu and browse to find the file. 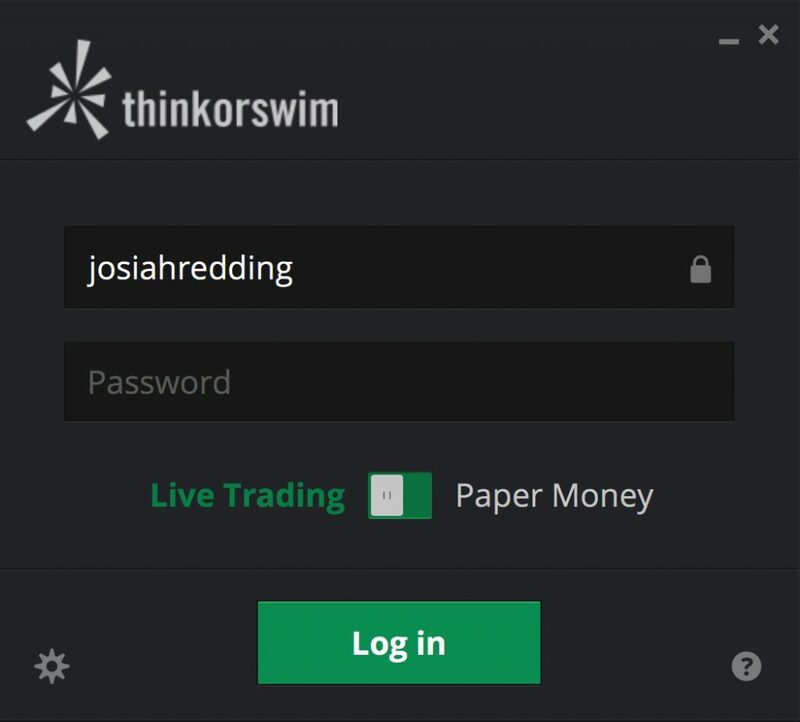 After you have all your options chosen and set how you like them, click Save to go back to the main thinkorswim login window. From there you can finish typing in your password, choose either Live Trading or PaperMoney simulated trading, and then click Log In. Once the thinkorswim login process is complete and the platform finishes loading, if this is your first launch, you may notice a popup called the “home screen”. This is ThinkOrSwim’s news and updates screen, featuring recent blog posts and streaming CNBC. You can close this out by clicking the X at the top right. And you can always re-open it by clicking Home Screen in the top right corner of the platform. I personally find the home screen popup to be annoying, and a lot of other people do to. But if you happen to be one of those people, you’re in luck. You can turn off the home screen popup very easily. Just click Setup in the top right corner, and select Application Settings. In the window that appears, click on Startup, and then uncheck the box that tells it to open the home screen on every startup. Accept the changes and you’re all set. Next time you launch the platform the popup won’t launch automatically. Hopefully this gives you a good comprehensive overview of logging in to ThinkOrSwim. If you have any questions feel free to leave a comment below. Incidentally, if you’ve forgotten your password or username, you can always go to the thinkorswim login help page and TD Ameritrade will get you set up. And here’s a full video on the TOS log in screen in case we missed anything in the tutorial above.